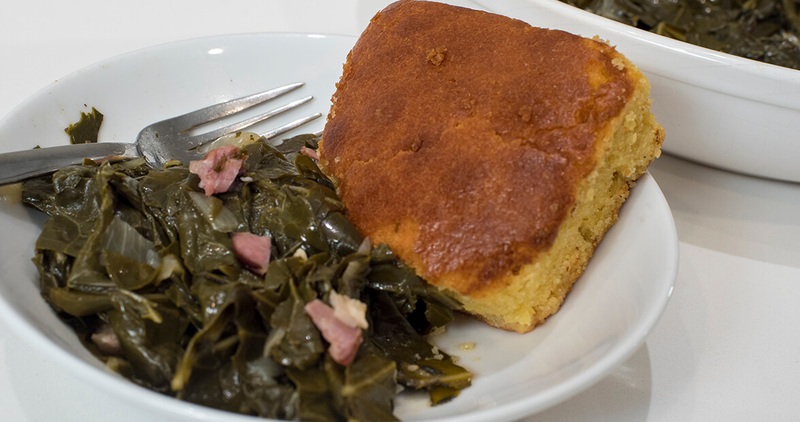 The pros know that the best way to serve this classic side is with a hearty piece of cornbread. 1 pound of fresh collard greens, washed and chopped. Place 3 quarts of water in a large pot and bring to a boil. Wash the ham hock and cut into sections. Add to boiling water and simmer for 30 minutes on medium heat. Wash the collard greens. Remove stems and roughly chop. Add the greens to the pot a little at a time; let them cook down and then add more. Once they’ve all been added, reduce the heat and let the greens simmer for thirty minutes. Chop the onions and garlic cloves. In a small saucepan add butter and melt over medium-low heat. Add the chopped onions and garlic and sauté until onions are translucent. Add the cooked onions and garlic to your stock pot with the collard leaves. Add salt, sugar, black pepper, and hot sauce. Stir and then simmer for 15 minutes or until the collards are tender. Using a slotted spoon, remove the greens and place in a bowl. Let the liquid continue to simmer. If desired, chop the greens into smaller pieces. Remove the ham hock; chop the meatier portions into small pieces and return to the liquid. Return the chopped collard greens to the liquid and stir well. Keep warm until mealtime. Serve with cornbread. Gordon is an award-winning food preservationist and fisherman based in Sanford. He regularly contributes recipes at ourstate.com and operates a Southern recipe blog, tasteofsouthern.com.